Malian Guitarist, Vieux Farka Toure, will be playing in Birmingham next week! Vieux Farka Toure is one of the most hotly tipped guitarists to have emerged from Africa. Rooted in the bluesy style of Saharan Africa, he has updated the roots rhythms, mixing traditions of his native Mali with technology, winning plaudits on the way. The son of the Grammy award winning desert blues guitarist Ali Farka Toure, Vieux Farka Toure’s path to success was far from straight forward. 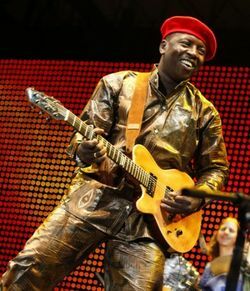 Initially his father tried hard to discourage him and Vieux Farka Toure hid his desire to play, joining music groups as though they were secret societies. Eventually he gained the blessing (and musical contribution) from Ali Farka Toure and Toumani Diabate on his debut album. Two years later his second album Fondo launched him on the international stage and the following year saw him perform at the opening concert for the 2010 world cup alongside Alicia Keys and Shakira. 2011 sees the release of his third studio album The Secret, which topped the US world music charts over the summer and a UK tour.